Selecting care for your eyes is an important decision. We are honored that you have chosen Five Points Eye Care for your vision and eye health needs. We are committed to helping you maintain healthy eyes and the best possible vision. Five Points Eye Care is located in Athens, Georgia in the historic Milledge Avenue District, close to downtown, the University of Georgia and the Five Points business district. Click here to take a brief video tour of our office. Five Points Eye Care Center’s core values are: Excellence in Eye Care, Patients Come First and We Lead by Example. We strive to give every patient a personalized, pleasant eye care experience in a professional atmosphere. Our doctors, Dr. Jon Forché , O.D., F.A.A.O., Dr. Nadine Forché , O.D., M.S., F.A.A.O. and Dr. Meg Brya, O.D., F.C.O.V.D., provide quality, experienced eye care. Drs. Jon and Nadine Forché are the only Diplomates of the American Board of Optometry in the Athens area. Our licensed dispensing opticians are committed to giving you personalized, knowledgeable service for all of your eyewear needs, providing a wide selection of frames and specialty lenses including children’s eyewear, industrial safety, designer frames and sunglasses, computer specific lenses and many more. Our friendly clinic and business office staff make every effort to create a caring, comfortable environment for every patient in our office. Five Points Eye Care Center is also an approved Worker Friendly business by the Economic Justice Coalition. This program encourages people to use and work for businesses that are friendly to workers in wages and benefits. We are proud to be one of the first businesses in the Athens-area designated as a Worker Friendly employer. Five Points Eye Care Center is a Vision Source practice, North America’s premier network of private practice optometrists. Vision Source practices are dedicated to providing you and your family the best in eye health care. We are also happy to accept Care Credit, which offers healthcare financing plans for our patients. Care Credit can be used to finance glasses, contact lenses and services. 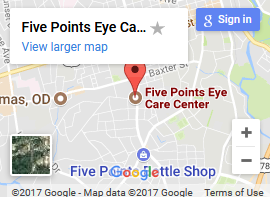 Five Points Eye Care is a comprehensive eye care center, offering complete visual and medical examinations of the eye for all ages of patients. At your visit for a comprehensive eye examination we will perform a prescription for glasses if needed, thoroughly check the outside and inside of the eye for problems or diseases, check the pressure inside your eye to screen for glaucoma and check your blood pressure. If you wear contact lenses or are interested in them, the doctors perform additional testing to determine the best contact lens prescription for your visual needs. If there are any eye problems found during your eye examination, the doctors will ensure you receive the best possible treatment. Patient education is an important part of our practice and we have computer-animated software in every exam room to explain your eye conditions. Our doctors strive to personalize the examination based on the needs of the patient, leaving plenty of time for any questions or concerns you may have. Five Points Eye Care believes in giving high quality care an d invests inthe most recent technological advances in the eye care field. Our office has a specialized computer called the Cirrus OCT that creates high-definition images of the inside of the eye to enable the doctors to diagnose glaucoma and retinal diseases before they affect vision. 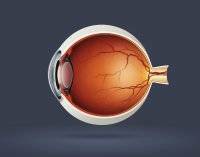 For treating glaucoma and other eye diseases, we also have a computerized visual field analyzer and a pachymeter to measure the thickness of the cornea. Our office provides digital ocular photography to document the appearance of the inside of your eye and a corneal topographer that enables the doctors to diagnose and treat corneal diseases and fit specialty contact lenses.